Overview: What Will I Learn? What makes CTU the Leader in firearms protection? Though their fundamentals have similar roots, it is their experiences that set them apart. 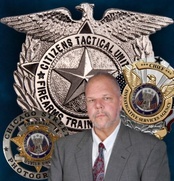 CTU's instructor and founder Tim Barton leads the industry with 28 year of experience employed as a Law Enforcement Agent, Firearms Instructor/Trainer and Hostage Negotiator. Any simple training course can qualify Private Citizens to receive a government issued Concealed Firearm Permit. © 2015 Citizens Tactical Unit - Firearms Training Academy, All Rights Reserved.